We apologize for keeping you waiting but hope you understand. Life gets a little crazy when you are moving households. Stone walls have to be the greatest invention of all time. The pyramids of Egypt, the ancient city of Machu Picchu, Hadrian's Wall, and the Great Wall of China have all been admired by billions of people for thousands of years. A wheel just goes around and around. And by the way, the VERY first wheels were believed to be made of? Yes, you guessed it. Stone. We all love the beauty and elegance of a natural stone wall, but for many do-it-yourselfers, deciding on certain things can be difficult. Should we have a natural or manufactured wall? Are you going to use a contractor, or build it yourself? What products and materials should you use? This is where Dream Yard comes in, as we love to provide information and help you with your questions. 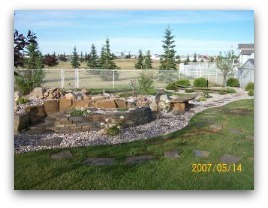 We want to save you time and money by showing you the different steps and processes of landscaping. The more you understand, the more you will save. Not just for do-it-yourself projects either. The more educated you are, the more likely you will be to choose the best contractor for the job. Building natural stone walls is an art and a craft, and I often here people say it is becoming a lost art. Is it a lost art? Or has society opted for cheaper and faster building techniques? After all, manufactured materials are easier to work with, faster to build with, and cheaper. The choice often boils down to time and money. If you have decided on natural stonework, finding someone that is specialized is a good start. They will usually be excited about your choice, and WANT to do the work. This helps ensure their pride and quality of a well built wall goes into the job. You are always looking for “Excellence”, so here is some help finding it no matter what kind of work you are having done. The above statement doesn't mean a general contractor can't build you a great wall. Many landscape companies have specialized people within their company. What often happens with this type of work is, they sub-contract it to someone else who is specialized. Don't be shy to ask questions about who is doing the work. You may already know the contractor's reputation, but the sub-contractor's reputation should be considered as well. Keep in mind that some companies mark up work that is sub-contracted with premiums, others don't. A good place to start your search is by driving around to spot out some of the better quality work in your area. Knocking on doors and complimenting people on their yard is a great way to find out who did the work. Many of the best walls will be done by someone who specializes in the art and craft of natural stonework. But don't be surprised if you find some great DIY projects either. Make a list of these people, because these are the ones you should be getting quotes from. There are signs to look for when receiving quotes and speaking with landscape contractors that can help you decide if they will be the right contractor for you. Remember that companies work with your ideas, your budget, their experience and what will be practical and functional. If they are strongly suggesting alternatives to your ideas based on these reasons, they are just being professional. On the other hand, if you really want a stone wall and a company is trying to persuade you into manufactured products or something else with no plausible reason, they are probably not interested in building it enough to warrant hiring them. Some companies will balloon a quote if they feel the work is time consuming, difficult for their skill level, or just undesirable. For most people specialized in building stone walls, it is a passion filled with pride. It's not about the money, although we don't work for free. It is more about the satisfaction and look on the customer's face when the job is done. For those of you looking for the best contractor, look for this sense of pride when you talk to them. Pictures are very important. I don't know of any landscapers that don't have a portfolio to show their prospective clients. When you sit down with a landscape contractor, they will be able to show you the quality of work that they do. Many of them have testimonials from happy customers as well. Don't completely dismiss, but red flag anyone with no pictures of previous work to show you. Some landscaping companies steer away from natural stonework because the jobs are not profitable enough. They can build three manufactured walls in the time they could build one natural stone wall. There are some great manufactured products on the market, and they have come a long way in looking more natural. There are also many companies doing beautiful work, but there will never be a substitute for natural stonework. Choosing a contractor that is right for you usually comes down to a gut feeling. If you like their work, and have a good feeling about them, and their company, you will most likely not go wrong. Natural Stone or Manufactured Products? I have quoted jobs where people have wanted natural stonework, but felt it was not within their budget. What they don't realize is that manufactured products are not that cheap. The gap between natural stone prices, and brick and block prices has closed in many regions. Check product prices before you dismiss what you really want. Smaller companies and individuals that specialize in natural stonework can sometimes have lower rates. They usually have less staff, and equipment overhead to pay for. You still have to keep in mind that cheaper is not always better when pricing jobs. A used car salesman from Virginia told me this line that made me laugh with his southern accent, but it's so true. Not many people are aware of this next thought, but we have all seen it many many times over the years. Manufactured walls will show every imperfection because they are perfect blocks. The lines in each level of stone can be affected by sinking, settling, and frost heave just like any wall. Natural stone walls will hide most small blemishes of settling or sinking soil. Brick walls will show them all. How many times have you seen a brick wall that looked terrible because of this? If you can't build on a hard subsoil and have a poorly prepared base, it will show in your wall sooner or later. Manufactured products can change or be discontinued. If you plan on adding to your project or yard, keep this in mind. 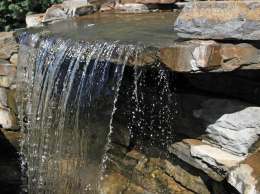 Natural stone yards can also stop carrying a particular type of stone at any time. The quarry that provides it could close or pricing may change enough to drop a line. These things are not common, but can still happen to you. It can be tempting to buy old or discontinued stock because it is usually discounted, but plan accordingly. Building a natural stone wall yourself may be an option for you. You can save thousands of dollars in the process. It may not be for everyone though. It requires a lot of time and patience, and like any do-it-yourself landscaping project, you must be aware of what can happen if you can't complete it. Most companies will NOT want to touch a project that has been started by someone else. This is a red flag for them. It sometimes can cost you more money than if you just left it to them at the start. No one will want to warranty their work if they have not had a hand in the project every step of the way. Even if you tell them that you prepared the sub-base exactly how you should have. Reading up on how to do a project is a great place to start. This will help you decide if it may be more than you can handle or not. We have a how-to module for building stone walls. It will take you through the whole process from start to finish with lots of tips along the way. This module can be viewed at Building a Dry Stack Stone Wall. What products should we use? Deciding on what products you should use is difficult if you are new to landscaping. Rather than try and explain this all to you here, we actually developed a section specifically for this question. Dream-yard went to a landscape supply yard and photographed the products they had. We wanted to show you what products are used for, and how to estimate your needs. Remember when building a wall that you must use the right product for the height you will be building too. You can visit this section at Estimating Materials. 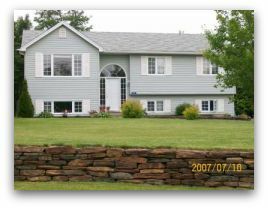 Another helpful article on our site about walls and hillside landscaping is Landscaping a Slope. In this article we talk about the forces of nature you will be dealing with when building retaining walls. 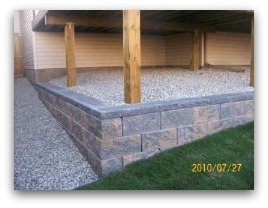 A stone wall is a beautiful, long standing monument and functional addition to your dream yard. 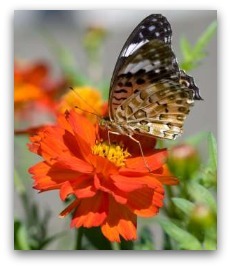 For a little inspiration, check out the Landscaping Walls Photo Gallery and Hillside Landscaping Photo Gallery for some great ideas. If you have a beautiful wall that you'd love to share, send it to us and we'll post it to help inspire others. Enjoy your stacking and chinking! Here it is: A continuation of our estimating series, we take you on a trip to a soil supplier. On this trip we walk you through the yard explaining what soil is, why it is so important for the success of your landscaping project and how to properly estimate it for your project. Check out our new information on Buying Soil. Finally, we have our newest How-to module that was released in April. From weeds, pests, and compaction to sterile soil and neglect, we cover Lawn Problems. How to diagnose them, decide if it is a simple fix or a major renovation that is needed to get your lawn looking its best, this year and for years to come. See you in a few weeks for our May edition!